UXBRIDGE, Canada, Sep 18 2012 (IPS) - Limiting climate change to two degrees C won’t save most coral reefs, according to new, state-of-the-art research. About 70 percent of corals are projected to suffer from long-term degradation by 2030 with two degrees C of warming, the first comprehensive global survey reported Sunday in the journal Nature Climate Change. The planet will get far hotter than two degrees C based on current commitments by countries to reduce their greenhouse gas emissions, mainly from burning oil, gas and coal. Humanity is on course to heat up the atmosphere an average of three and even four degrees C, according to the Climate Action Tracker, an international scientific monitor. Those temperature levels are what most scientists consider “catastrophic”. Global temperatures have risen an average of about 0.8C so far and already melted much of the Arctic and generated costly extreme weather events around the planet. Keeping that global average increase below two degrees is only a matter of “political will” not technology, said Bill Hare, director of Climate Analytics, one of the partners in the Climate Action Tracker. If humanity wants to keep at least half of the remaining coral reefs, then global temperatures cannot rise to 1.5C. “Limiting global warming to 2 C is unlikely to save most coral reefs,” the paper reports. “We must realise what is at stake as global temperatures rise,” said co-author Malte Meinshausen of School of Earth Sciences at the University of Melbourne. “Countries must be as ambitious as possible in their emission reductions to give corals a chance,” Meinshausen told IPS. Coral reefs are considered by many to be one of the life-support systems essential for human survival. For more than 2.6 billion people, seafood is the main source of protein. Corals act as the nurseries and habitat for many fish species, and are vital for up to 33 percent of all ocean species, according to the World Conservation Union (IUCN). Reefs also provide vital shoreline protection from storms. 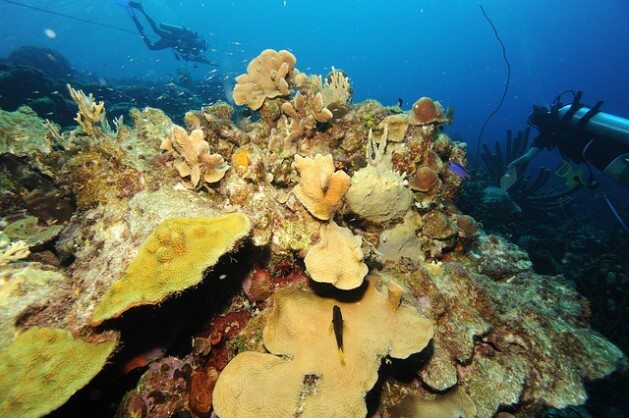 Without reefs, for example, Belize would suffer 240 million dollars in damage from storms, according to one estimate. This study used the very latest climate models and applied them to growing science about the impacts of rising temperatures and acidification levels projected in the decades to come, said co-author Simon Donner, a marine biologist and climatologist at the University of British Columbia. The increasing ocean acid conditions appear to be reducing coral’s thermal tolerance, Donner said in an interview. Tropical corals have a narrow water temperature range in which they thrive. When water temperature rises only two or three degrees, they “bleach” or turn white. Corals can survive this, but if the heat stress persists long enough – weeks instead of days – the corals can die in great numbers, as they did in 1998 when 16 percent of the world’s tropical corals died. Emissions of greenhouse gases are not only warming the oceans, they have also made them 30 percent more acidic. The oceans and the atmosphere are intimately connected. When CO2 is released into the atmosphere from burning fossil fuels, some of that extra CO2 combines with carbonate ions in seawater, forming carbonic acid. This level of change in ocean chemistry has not happened in millions of years and is beginning to dissolve reefs. Some corals will undoubtedly survive and some will adapt to the new conditions, although the changes are far more rapid than anything corals have ever experienced, said Donner. “The bottom line is that humanity will lose the services that corals have provided for thousands of years,” he said. Even at 1.5 C degrees of warming, only about half corals are likely to survive, the study found. That adds scientific weight to the small island nations’ and other countries’ call for a global target of 1.5 C, Donner said. Every nation in the world officially agreed to keep global temperature increase below two degrees C at a U.N. climate meeting in Cancun, Mexico in 2010. An alliance of small islands and African countries had lobbied for the global target of less than 1.5 C due to the damages they are expected to suffer if temperatures rise above that mark. Emissions must begin to decline this decade for either target so it is pointless to debate these targets right now, says Meinshausen. Once emissions are in significant decline, then how fast and how deep those cuts will have relevance for the final target, he said. “I fear we’re going to miss our only chance to peak emissions this decade,” he said. Some of that fear arises from recent musings by U.S. representatives at a recent U.N. climate meeting in Bangkok on the need for a more flexible target than two degrees C.
There are a number of studies showing how the two-degree target can be reached at modest cost and with a number of benefits such as reduced air pollution. Nicely done, Stephen! Hope to see you at WILD10.